After a weekend of In-N-Out Burger and my first taste of El Pollo Loco (awesome churros, surprisingly good flan, filling taquitos), I was in back Colorado feeling pessimistic about lunch. Having spent almost my entire lunch hour wandering around Best Buy, my options were suddenly limited to only the fastest fast food choices. Knowing Burger King would fail to satisfy me after having recently known the joys of the Double-Double twice over, I was left with the last resort of the harried and hurried: a gas station sandwich. I was delighted to discover this particular gas station offered a wide variety of meal options, including a glass case full of lamp-heated deli items that included staples like fried chicken as well as more intriguing choices. I gazed, amazed, at the greasy bounty. The two items that caught my eye were the tall pile of gizzards (breaded and fried; probably chicken-derived) and a plate of “Jamaican Meat Pies,” which were little dough pockets that looked like empanadas. Their meaty insides were not visible, so my guess is as good as anyone’s as to what was inside. Gizzards and jerk seasoning, perhaps? No matter how curious I was, I was still deathly afraid of most of the foods in the glass case, so I stuck to my original plan. Thankfully, the gas station also had quite a few Deli Express-brand sandwiches to choose from. The most appealing-sounding one was the Muffuletta, which is a regional sandy found in New Orleans and distinguished by spiced meats, special bread, provolone and an often delicious olive spread. Unfortunately, the gas station version consisted of no more than white bread, “spicy ham” and pepperoni. “That’s no muffuletta,” I imagined myself saying to the indifferent clerk at the counter. 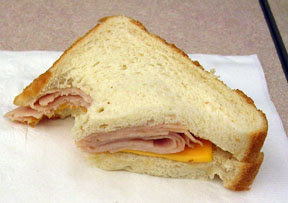 After much staring at the case and overanalyzing its offerings, I settled on the humble MEGA Turkey & Cheese sandwich. Its flavor was mild and predictable. I literally patted myself on the back for correctly guessing it would taste like pressed turkey and American cheese. The Heinz yellow mustard I added to the second half overpowered the whole taste and dominated every bite I took thereafter. I regretted not having grabbed some of the more exotic sauce packets, such as the Chinese mustard, sweet and sour sauce, or hot sauce. I’m so sick of yellow mustard. Sometimes the drudgery of life can be almost too much to bear. Despite containing close to a dozen preservatives and mysterious other ingredients such as “dough conditioners” and calcium propionate, which the package claimed is in the bread "to retard spoilage,” the bread went stale before I finished eating it. Granted, I let the sandwich sit for 10 or 15 minutes while I got batteries for the camera, but come on. The surface exposed to the air went from the consistency of a sponge cake to that or a wet, then dried kitchen sponge. The bread became rough and brittle — running a finger across the sandwichtop produced crumbs. I wondered why. Perhaps it had to do with the pillow of air the sandwich came in. According to Deli Express, they pack their sandies using “a state-of-the-art process called MAP - Modified Atmosphere Packaging.” Since they don’t elaborate, I have to assume the process is something akin to a dutch oven. This would also account for the unsettling dampness that coated the sandwich, but hopefully not. To Deli Express’ credit, the bread didn’t stick to the roof of my mouth, which everyone knows is the fatal flaw of many Caucasian sandwichbreads. The turkey was cheap-tasting pressed deli meat; no more, no less. Fine. Ditto for the American cheese, which tasted like slightly thicker, less tasty Kraft. I had low hopes for this sandwich and it delivered. But its $3.09 asking price was a bit steep for such a bland, uninspired sandy. I’d have paid no more than $2.50 if the clerk had been open to bargaining, which he clearly wasn’t. Next time — and hopefully there won’t be one at this particular gas station — I’ll get a Jamaican Meat Pie. “Fresh taste guaranteed or your money back! White bread, oven roasted turkey breast with white turkey (poultry ingredients (turkey breast, white turkey), water, potassium lactate, modified food starch, dextrose, salt, sodium phosphate, sodium diacetate, flavorings, celery juice (ed. what? )), pasteurized process American cheese. Pros: The sandwich has only 310 calories and 7 grams of sugar and includes 2 grams of fiber and a goodly 22 grams of protein. It also provides 20 percent of your daily value of calcium and iron, and contains and no trans fats, which are supposedly really bad for you. Cons: The bread, cheese and turkey all feature several unpronounceable ingredients. The sandwich includes some saturated fat and 54 percent of your day's sodium allotment.